The National Council of Teachers of English and the International Reading Association have teamed up to create readwritethink.org, whose mission is to provide the highest quality practices in reading and language arts instruction by offering an awesome amount of free materials. On their website, they have tons of interactives including about two dozen that help to reinforce the basic skills of organizing and summarizing. 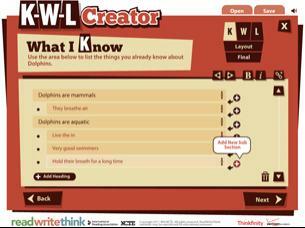 Try this K-W-L interactive with your students to teach them how to prepare to read and write by organizing what they know (K), what they want to learn (W), and what new information they learned after reading (L). Try using an interactive organizer like this in conjunction with quality nonfiction like this New York Times article, Squabble Disrupts a Refuge for the Rich. In this article, Robin Pogrebin describes the controversy surrounding a proposal to build a visitors center at a famed Gilded Age Vanderbilt family mansion in Rhode Island. To incorporate some STEM in your classes you could use this article about two scientists trying to use a process called synthetic biology to grow plants that glow in the night. Using an interactive organizer like a K-W-L chart can organize thoughts and reinforce understanding as students begin to read complex texts. The interactives on readwritethink.org are easy and fun to use. Try this one called Literary Graffiti that teaches students to visualize what they are reading and to create graphic symbols to help them develop as readers. 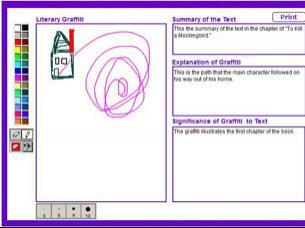 And best of all, after using the interactives student work can be saved in .pdf form or printed. Thanks to Mike Sorge for showing me these fantastic resources!